The intensity of bombings in the Israeli military operation “Protective Edge” makes it extremely dangerous for the population and MSF teams in Gaza to move around. As of today, hospitals in Gaza are managing to cope with the influx of wounded arriving. However, the new crisis is aggravating an already fragile health system heavily affected by chronic shortages and structural weaknesses. An average of 10 bombings per hour makes it practically impossible for MSF teams to continue with its regular medical activities and to move around to evaluate where the most urgent needs are. In two days alone there have been more strikes than in eight days of the 2012 military operation Pillar of Defense. In Gaza, health authorities have reported more than 80 deaths, including thirty women and children, and over 600 wounded. On Thursday night, the bombing of one house killed eight people including five children. “In the first few days, people received an SMS to warn them that an attack on their building was imminent. 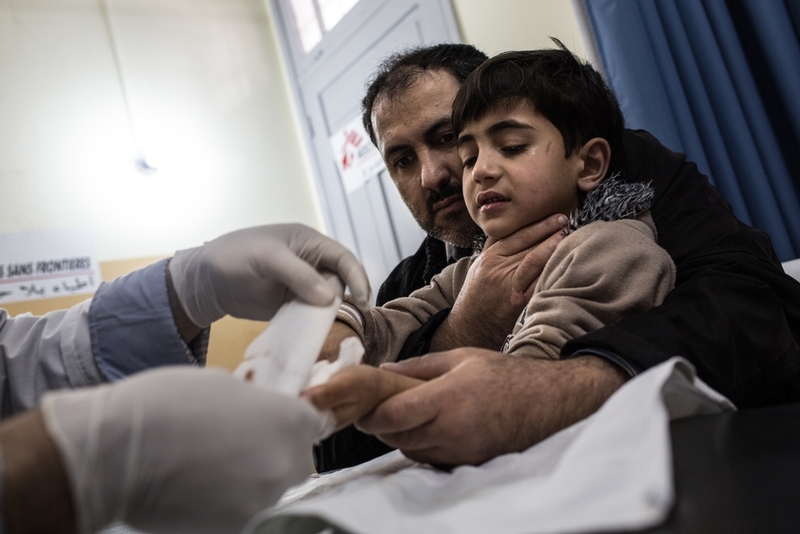 But today, this does not seems to happen systematically,” says Nicolas Palarus, MSF project coordinator in Gaza. On Thursday, twelve patients living close to the MSF post-operative clinic were able to go to receive their treatment. But most of the patients who regularly come to the clinic live in the south of Gaza strip, and our teams have been unable to reach them. Several health structures, including the European hospital, have been damaged by nearby strikes. The streets of Gaza are completely empty as people only leave their homes in case of an urgent need. On Thursday, 150 houses were destroyed and the water pipe supplying "Shati camp" was damaged by a nearby strike. The 900 people who lost all their belongings are now being housed by their families and friends. Due to fuel shortages, only 50% of ambulances are able to circulate. MSF is in daily contact with local health authorities and has visited two hospitals; the Al Shifa hospital in Gaza city and Khan Younis hospital in the south of Gaza strip. "Even before now, the hospitals in Gaza were suffering from chronic shortages of medicine and disposables. So this crisis is weakening an already precarious system,” warns Nicolas Palarus. MSF teams have received authorisation to donate emergency medical supplies to Nasser Hospital. In Shifa hospital, health officials informed MSF teams on Friday that the situation was still manageable despite some drug shortages. Though most patients hospitalized so far have not suffered from severe injuries, the number of severely wounded is increasing. The most urgent needs are currently found in the emergency rooms, and are increasing in intensive care units and the operating theatres. The Rafah border crossing, between the Gaza Strip and Egypt, has opened occasionally and for very specific reasons. On Thursday, only eleven patients were transferred to Egypt, and another four patients crossed on Saturday. It appears that only those people having an international passport are authorised to cross the border. A medical team coming from different Arab countries is waiting to enter Gaza without success until now. MSF has been working in Gaza for over ten years. The MSF clinic in Gaza town specialises in post-operative care (dressings and physiotherapy), in particular for burn patients. In Nasser hospital in Khan Yunis city, south of Gaza, MSF organises training for medical and paramedical teams working in intensive care, and provides specialised training in hand surgery. MSF has two surgical teams ready to enter Gaza and help Palestinian hospital staff.